GM Sevian is the youngest grandmaster in USA history, achieving the title at the age of 13 years, 10 months, and 27 days. In November of 2012, his rating was so high for his age group that he managed to win the U12 World Championship, scoring 9 out of a possible 11 points, and he still LOST rating points. 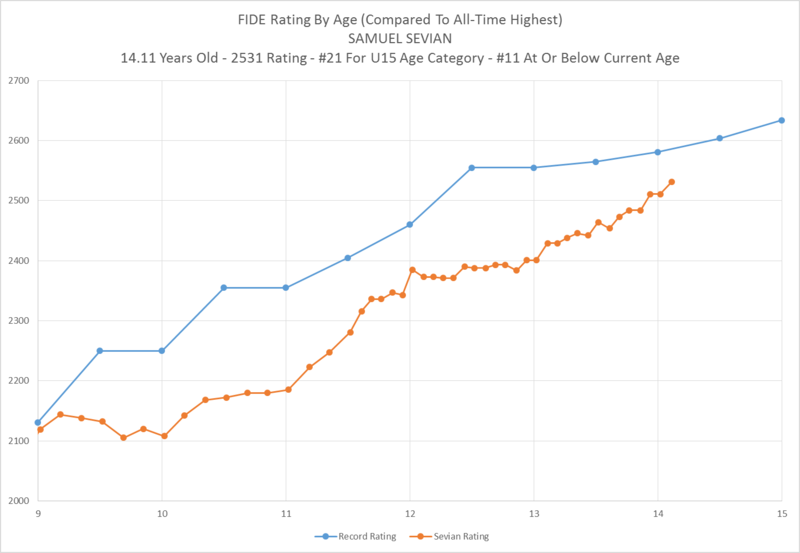 His prodigy status peaked with his rating of 2385 on the January 2013 rating list, published when Sevian was 12.02 years old. At that point he was tied with Peter Leko as the fifth highest rated player ever, at or before his age. Between Sevian’s 12th and 13th birthdays, his stock as a potential record setter slipped slightly, as he picked up only 16 rating points in the 12 month span, but over the last year he has gone on a tear. Since the beginning of 2014, Sevian has picked up his IM and GM titles, and gained 130 rating points in the last 13 months (as of the February 2015 rating list). His rating is just two points shy of being among the 10 best ever achieved at his current age, and only 50 points behind Magnus Calsen’s record for highest rating EVER by 14 years and 1 month old. If he keeps racking up rating points at this average of 10 per month, he may yet have hope of setting a world rating record. 110 points in the next 11 months, for instance, would put him at 2641, which would break Wei Yi’s record of the highest rating ever achieved at the age of 15. Most recently, Sevian tied for 5th place (out of 14 players) in the Challengers section of the prestigious Tata Steel tournament at Wijk Aan Zee. This despite being only the #12 seed by rating. What does the rest of 2015 (and beyond) hold for the young American superstar? We can only wait and see.